Matchroom Sport is thrilled to announce Britain’s Got Talent stars Boogie Storm will be bringing their unique act to the World Cup of Gymnastics at The O2, London on April 8, 2017. Dressed head to toe in iconic white Stormtrooper outfits, the six members of Boogie Storm are a force to be reckoned with. Crushing dance routines so tight they’d impress Yoda himself, the group have accumulated over 50 million YouTube hits to date, and there seems to be no sign of them slowing down. Having reached the live final and finished third in Britain’s Got Talent’s 10th anniversary in 2016, the troop have now been nominated for the best performance of 2016 at the National Reality Television Awards, as the accolades just keep on coming. 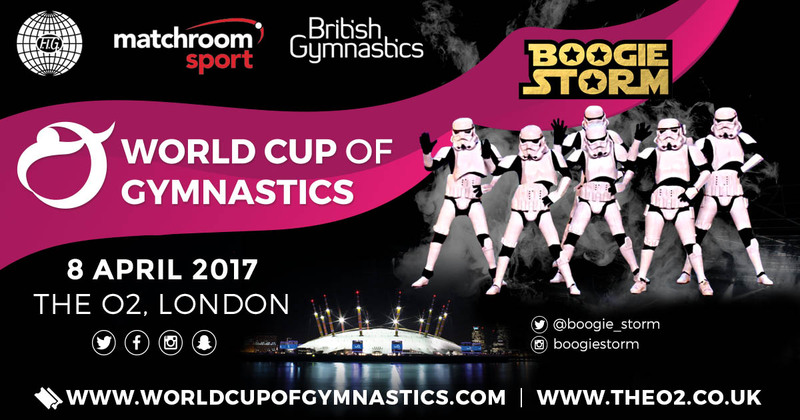 Boogie Storm will perform live during both sessions of the World Cup of Gymnastics and will be spotted in all corners of The O2 as they entertain the crowd, sign autographs and pose for selfies throughout the day. A new venture for Barry Hearn’s Matchroom Sport, the World Cup of Gymnastics sees the world’s best gymnasts invited to compete in the prestigious ‘all-around’ competition with the men battling it out over six testing apparatus (floor, pommel horse, rings, vault, parallel bars and the high bar) and the women competing on vault, uneven bars, beam and floor. In association with British Gymnastics, the event will take place at The O2, London on Saturday, April 8, 2017, and will be broadcast live by Sky Sports. The women’s competition will take place in the afternoon from 1pm with the men’s competition to take place during the evening session from 7pm. A spokesperson for Matchroom Sport commented: “Boogie Storm wowed TV audiences on Britain’s Got Talent last year and we know they will do just the same at the World Cup of Gymnastics. Tickets for the World Cup of Gymnastics are selling fast with limited tickets available for the women’s session. Prices start from £30 per session, with family tickets for the whole day available from £99. Platinum VIP packages are available from £200 per person per session. For more information, please visit www.worldcupofgymnastics.com.